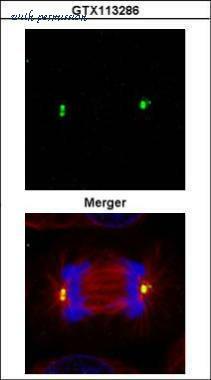 Immunofluorescent analysis of g-Tubulin using anti-g-Tubulin monoclonal antibody (Pierce Product# MA1-850, Clone 4D11) (shown in green) in HeLa (A) and U2-OS cells (B). 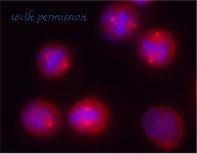 Formalin fixed cells were permeabilized with 0.1% Triton X-100 in TBS for 10 minutes at room temperature. 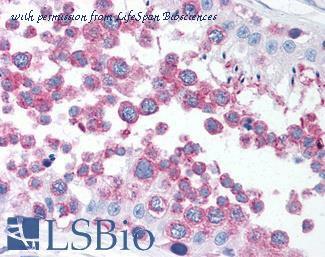 Cells were then blocked with 1% Blocker BSA (Pierce Product #37525) for 15 minutes at room temperature. Cells were probed with a mouse monoclonal antibody recognizing g-Tubulin (Pierce Product# MA1-850), at a dilution of 1:50 for at least 1 hour at room temperature. Cells were washed with PBS and incubated with DyLight 488 goat-anti-mouse secondary antibody (Pierce Product# 35503) at a dilution of 1:400 for 30 minutes at room temperature. F-Actin (red) was stained with DY-547 phalloidin, nuclei (blue) were stained with Hoechst 33342 dye (Pierce Product# 62249). Images were taken on a Thermo Scientific ArrayScan at 20X magnification. 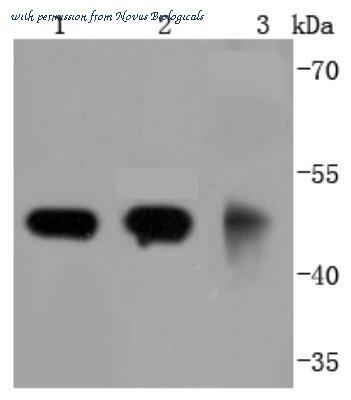 Western blot analysis of ?-Tubulin was performed by loading 50ug of various whole cell lysates onto a 4-20% Tris-HCl polyacrylamide gel. Proteins were transferred to a PVDF membrane and blocked with 5% Milk/TBST for at least 1 hour. Membranes were probed with a mouse monoclonal antibody recognizing g-Tubulin (Pierce Product # MA1-850, Clone 4D11) at a dilution of 1:1000 overnight at 4°C on a rocking platform. 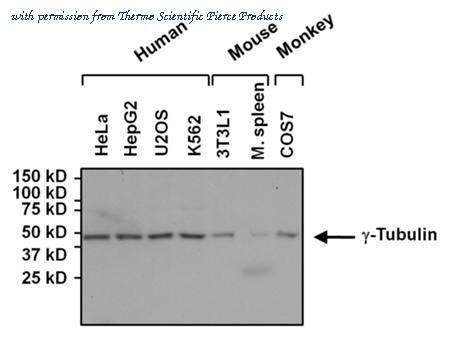 Membranes were washed in TBS-0.1%Tween 20 and probed with a goat anti-mouse-HRP secondary antibody (Pierce Product # 31430) at a dilution of 1:20,000 for at least one hour. Membranes were washed and chemiluminescent detection performed using Pierce Super Signal West Dura (Pierce Product #34075). The gamma Tubulin antibody from Proteintech is a rabbit polyclonal antibody to a recombinant protein of human gamma Tubulin. This antibody recognizes human,mouse,rat, dog antigen. 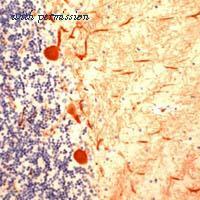 The gamma Tubulin antibody has been validated for the following applications: ELISA, IF, WB, IP, IHC analysis. 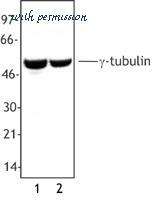 The gamma tubulin antibody from Proteintech is a rabbit polyclonal antibody to a fusion protein of human gamma tubulin. This antibody recognizes human, dog, mouse antigen. 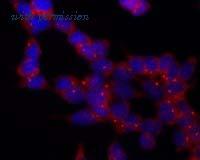 The gamma tubulin antibody has been validated for the following applications: ELISA, WB, IF analysis. 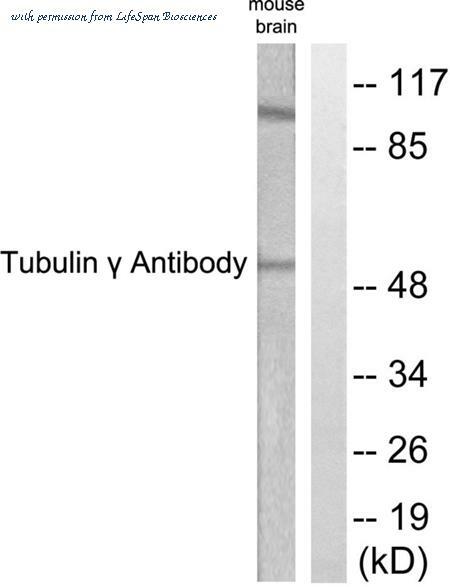 The gamma tubulin antibody from Proteintech is a mouse monoclonal antibody to a recombinant protein of human gamma tubulin. This antibody recognizes human,dog antigen. 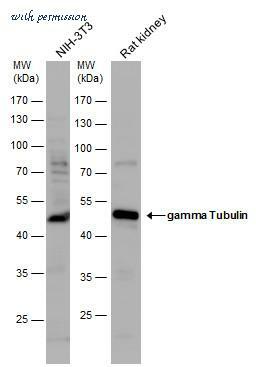 The gamma tubulin antibody has been validated for the following applications: ELISA, IF, WB analysis. Confocal immunofluorescence analysis (Olympus FV10i) of methanol-fixed 293T, using gamma Tubulin(GTX113286) antibody (Green) at 1:500 dilution. 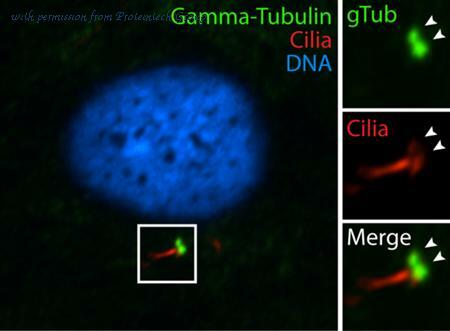 Alpha-tubulin filaments were labeled with GTX11304 (Red) at 1:500. 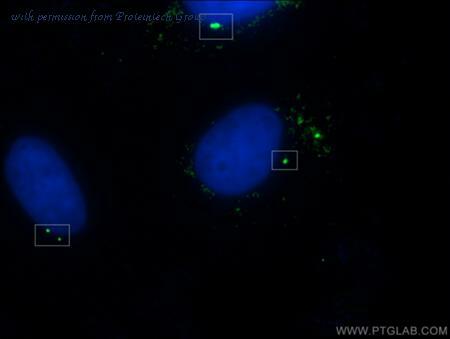 Confocal immunofluorescence analysis (Olympus FV10i) of paraformaldehyde-fixed 293T, using gamma Tubulin(GTX113286) antibody (Green) at 1:500 dilution. Alpha-tubulin filaments were labeled with GTX11304 (Red) at 1:500.
gamma Tubulin antibody detects gamma Tubulin protein by western blot analysis. 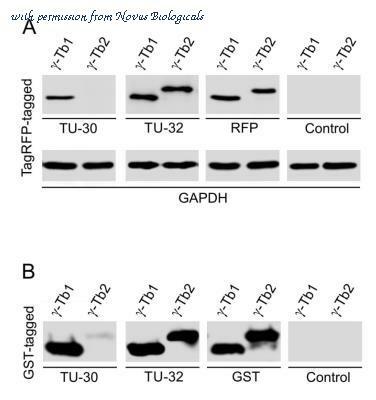 NIH3T3 whole cell extracts (30 ?g) and rat tissue extracts (50 ?g) were separated by 10% SDS-PAGE, and the membrane was blotted with gamma Tubulin antibody (GTX113286) diluted by 1:1000. Anti-TUBG1 / Gamma Tubulin antibody IHC of human testis. Immunohistochemistry of formalin-fixed, paraffin-embedded tissue after heat-induced antigen retrieval. Antibody dilution 1:50. Whole cell extract from A431 cells (Lane 1) and NIH3T3 cells (Lane 2) were resolved by electrophoresis, transferred to nitrocellulose and probed with rabbit anti--tubulin antibody. Proteins were visualized using a donkey anti-rabbit secondary conjugated to HRP and a chemiluminescence detection system. 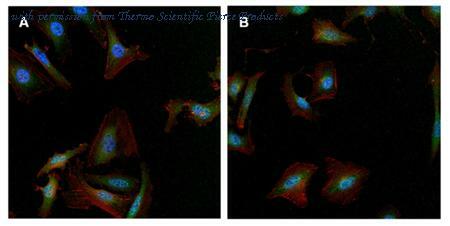 Overnight nocodazole treated Hela cells stained with purified rabbit polyclonal antibody against -tubulin, followed by Rhodamine Red-X conjugated goat anti-rabbit IgG and DAPI. 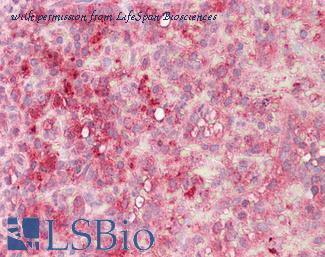 Anti-TUBG1 / Gamma Tubulin antibody IHC of human spleen. Immunohistochemistry of formalin-fixed, paraffin-embedded tissue after heat-induced antigen retrieval. Antibody dilution 1:100. 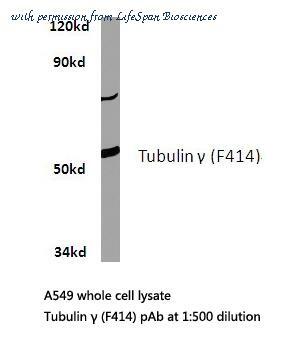 Western blot analysis of lysates from mouse brain, using Tubulin gamma Antibody. The lane on the right is blocked with the synthesized peptide. 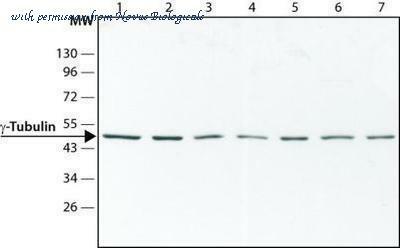 Western blot of Tubulin (F414) pAb in extracts from A549 cells. 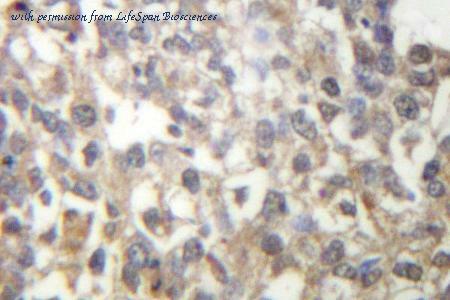 IHC of Tubulin (F414) pAb in paraffin-embedded human breast carcinoma tissue. Immunocytochemistry/Immunofluorescence: gamma Tubulin Antibody (TU-30) [NB500-574] - Staining of microtubular networks in 3T3 mouse fibroblasts. 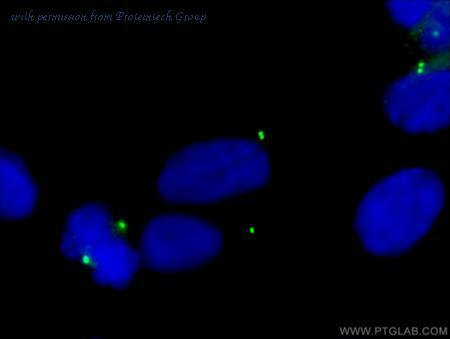 3A - metaphase; 3B - anaphase; 3C - telophase Gamma-tubulin (red) stained with anti-gamma-tubulin (TU-30), alpha-tubulin (green) with polyclonal anti-alpha-tubulin antibody and nuclei with DAPI (blue). Immunocytochemistry/Immunofluorescence: gamma Tubulin Antibody (TU-30) [NB500-574] - Staining of mouse fibroblasts using anti-gamma-tubulin (TU-30; direct conjugate with Dyomics 547, red). 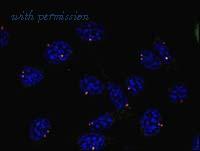 Nuclei were stained with DAPI (blue). 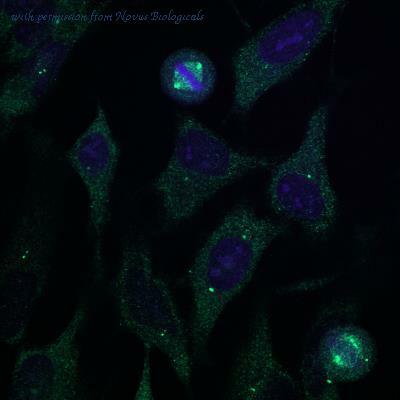 Immunofluorescence: gamma Tubulin Antibody (TU-30) [NB500-574] - Staining of HeLa cells using anti-gamma Tubulin antibody (green). 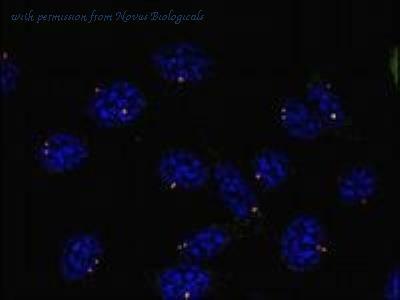 Nuclei were stained with DAPI (blue). Image from verified customer review.